Leela: The most important thing is a sense of humour. For example, doctors have a great sense of humour, as do investment bankers, senators, and heirs to the British crown. Amy: He has to appreciate my cuteness and emotionality and not get all weird because my parents own half of Mars. I guess every girl faces that problem. What, they don't? Shploops! 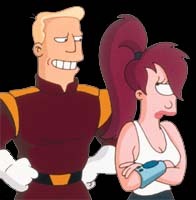 Leela, are men of the future intimidated by your intelligence and natural leadership? On the contrary, I'm able to fool myself into thinking they find it attractive. And how about your freakishly large single eye? They aren't really intimidated, but sometimes they vomit a little. Leela, what advice would you give women on how to handle romantic advances in the workplace? For example, what do you do when your co-worker Fry hits on you? I try not to get mad at Fry, because it's not really his fault. As a primitive 20th century man, he still thinks with his you-know-what. His brain. Luckily, ever since the Equal Rights Amendment finally got passed in 2850, men have their thoughts beamed to them from a central femputer. Yep, that's what happens when women get equal rights. Next question. Amy, we've heard of all the games that go on in the dating world. Do you think these help or hurt the dating process? Games are excellent for dating. For example, a typical game is telling your boyfriend you want to see other people. So then he says, "Spleesh, then I want to see other people too." And then you both have a lot more dating of other people! Leela, do you think dating games make it easier or harder to have a relationship? If you really loved me, you'd already know what I think. Can you please describe for us your dream man? 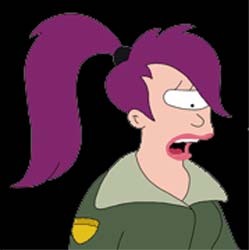 Leela: He'd come from the stars, tall and strong, with a gleam in his freakishly large single eye and a great sense of humour consisting of 30 percent bonds, 70 percent stocks. Amy, as a cute, young university student and Planet Express intern, how do you find the dating world treating you? Being an intern is great for dating! I can't tell you how many guys have said, "So, you're an intern. How fascinating. Why don't we go back to my place and you can tell me all about it?" Amy, what do you think are the best ways to attract your ideal man? Frankly, it helps to hang out with someone less attractive, so you'll look better by comparison. 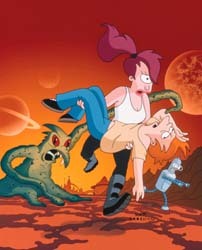 By the way, Leela, see you at the disco tonight? Leela, you're a couple of years older than Amy. As a result, do you see much difference in the types of men you each prefer as well as how you are treated by men? Age is just a matter of perspective. For example, in Jupiter years, Amy and I are actually the same age -- two. So we're much too young to be dating anyway, which is why I don't have a boyfriend, okay?